Amanda Kass is the Associate Director of the Government Finance Research Center. As Associate Director she designs, conducts, and manages research in the GFRC's priority areas. Amanda also works with the faculty and external advisory panels to advance the GFRC’s goals and disseminate its research. 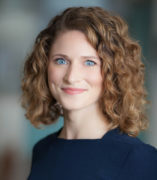 Amanda has previously worked at the Center for Tax and Budget Accountability and the University of Chicago’s Center for Municipal Finance. Amanda’s research focuses on state and local finance, with sub-specialties in pensions, housing, and fiscal analysis. Her work has been published in Chicago Magazine and Urban Affairs Review. She has appeared in various media outlets, including Bloomberg, the Bond Buyer, Chicago Sun-Times, Chicago Tribune, Crain’s Chicago Business, Reuters, Tax Analysts, and WTTW’s Chicago Tonight. Amanda is also a doctoral candidate in Urban Planning and Policy at the University of Illinois at Chicago. She holds an M.A. in Geography from the University of Colorado at Boulder, and a B.A. in Geography and International Studies from the Ohio State University.